From bungalows to 5-level splits, Calgary’s real estate offers a variety of house styles. Here is an overview of the type of single-family homes that can be selected in the MLS. While the examples are very general, Calgary real estate is very diverse and some communities are more consistent with a particular home style than other communities. A bungalow has everything on one level – for many people that is the main advantage. 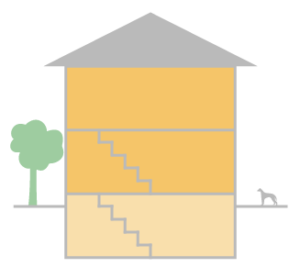 There is one set of stairs in a bungalow, which leads to the basement. The basements are fairly easy to develop and often create a lot of extra space in the bungalow. Think of a guest area, an entertainment area or the teenage kids domain. Bungalows can be great for downsizers, and they can have everything on the main floor – even a washer and dryer! A disadvantage of a bungalow can be the size, especially for families. Older bungalows often only have one bathroom on the main floor, although some older homes offer a 2 or 3 piece ensuite. 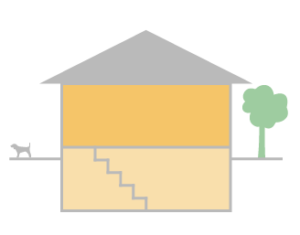 Most bungalows have 2 or 3 bedrooms on the main floor. An average size can be between 900 and 1200 sq ft. Older bungalows, which can date back to the 1930s, are usually on the smaller size while those built in 1950 – 1970 are a bit larger. Most older bungalows have their garage detached, but there are older bungalows where you can find the garage attached. Bungalows are still being built in newer communities in Calgary, together in the mix with 2-storey homes. In some older Calgary communities, the zoning is R-C2. Those areas are called transition areas and are interesting to builders. They often demolish older bungalows and build two infills. Depending on the condition of the bungalow and the zoning of the area, it may or may not make sense to renovate. A bi-level can be seen as a raised bungalow. Because the bungalow is raised, it allows for bigger windows in the basement and therefore more natural light in a basement. For many people, it feels more like a living area than the basement of a regular bungalow. 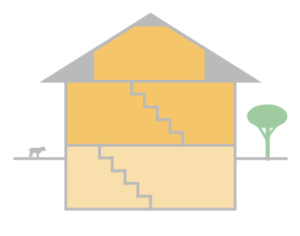 When you enter a bi-level bungalow, you have to choose a set of stairs to either go up to the living area and kitchen, or go downstairs towards the basement. Almost all bi-level basements are developed, just because it allows for so much more living area with natural light. Larger families like bi-levels – it gives the kids their own domain downstairs. Bi-levels are more economical yet less popular than bungalows. They are not as common, but they are still being built today so they can be found in older and newer communities. In Calgary we see three-level splits, four-level splits and five-level splits. Take a bungalow, split it in two in the middle, and raise one half of it. 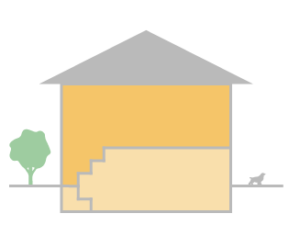 The different areas are connected with half stairs. From the living and kitchen area, you take half stairs up to the bedrooms and bathroom, or half stairs down to the lower areas. There can be another living area, bedrooms or a basement, all depending of the number of levels. A five-level split has four half stairs in the house. The four-level split has three half stairs, and the three-level split has two half stairs. The same as bi-levels, the split-level homes are less prevalent and a little less popular. Level splits do offer more square footage, but the areas are a little more boxed and connected through lots of stairs. This can be an advantage for a family because privacy is a bit easier to find in a split level than in a bungalow. Also the first level half below grade still offers plenty of natural light because the windows are bigger. Split levels are still being built and are available in newer communities in Calgary. Two-storey homes are, together with the bungalows, the most popular style homes in Calgary. 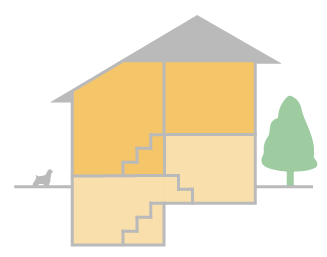 Take two bungalows and stack them; the footprint is the same, but you have the most room available for a family. 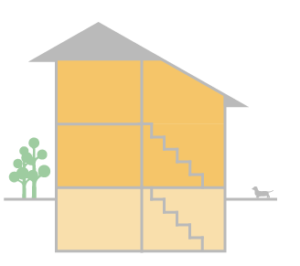 Two-storey homes also offer basements that can be developed, which gives a family three levels of living space. 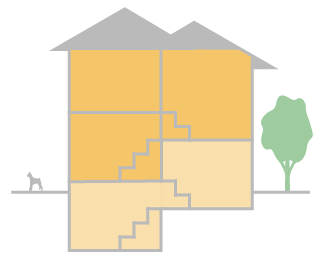 Economically two-storey homes give you the most space. There are also some three-storey homes being built, which gives four levels of living space. Especially in the newer communities of Calgary, most homes being built are two-storey homes. Garages can either be attached or detached. In the inner-city area of Calgary, there are many communities zoned R-C2. These transition-areas give builders the opportunity to take down the bungalow and build two infills, either attached or detached. Infills are narrow and deep and most infills are two-storey, although there are three-storeys being built as well. Most infills have a developed basement or at least a basement that can be developed to add an extra level of living space. Infills have less yard, because the garage is also in the back. Another disadvantage to infills we sometimes hear, is the fact that they are narrow and don’t have enough side windows and less natural light. A close variation to a two-storey home is a two-storey split. Usually with one extra smaller set of stairs. One-and-a-half-storey homes were mostly being built until around the 1950s in Calgary, although newer homes are still around. The second level has a high pitched roof, and bedrooms on the second level have a slanted roof. Those style homes are often in older communities. The disadvantage is that the home gives less living space, because of the slanted roof. 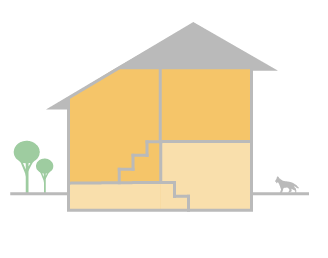 Two-and-a-half-storey homes is probably the smallest group of home styles in Calgary. Most can be found in the inner-city area. The top floor is often slanted, which gives the slanted ceilings. These examples are based on Calgary homes and are very general. Older areas can offer many different types of homes. If you are looking for a particular style home, you are not limited to any one community. The MLS offers on average 5,000 homes for sale in Calgary! If you are looking for a particular style, these styles can be easily found with that parameter, not exclusive to any one community in Calgary.